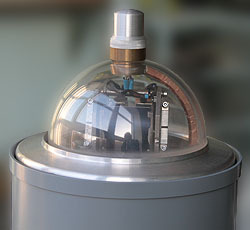 Purpose: solution of the tasks involving search for targets in the circular zone by the single-frame photography, cyclic tracking of detected objects with a successive transfer of the optical axis, capture and tracking of the detected objects with a constant holdback of the optical axis on the accompanying object. 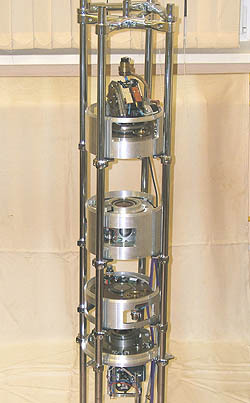 The OESCS has a minimum survey time of the given circular zone and the minimum weight dimensions. The device allows one to make a single-frame photography of the scanned area at a constant speed of azimuthal scanning and the MFP operation in the snap shot. 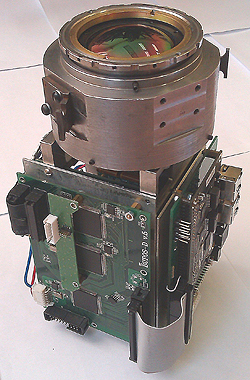 Compensation of azimuth image lubrication for the signal accumulation time is performed by a harmonic scanner, included in the optical-mechanical circuit and working with the MFP frame rate. To fully utilize the photosensitive surface of the MFP and compensate the radial lubrication of the image, an image compensator synchronized with the azimuthal scan is included in the circuit. The OESCS uses a 640x512 pixel, a step of 15 μm, a frame rate of up to 100 Hz. 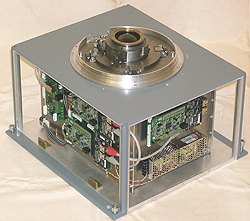 MFP is equipped with a cold diaphragm F / 2 and a cooled optical filter with Δλ = 3,7 - 4,8 μm. The focal distance of the optical system is f = 70 mm, the light diameter of the entrance pupil is Ø = 30 mm, the instantaneous field of view (angular frame size) is 7.84 ° x6.28 °, the angular size of the pixel γ=0,74°, the angular size of the scattering circle γ = 1.7 °. When the MFP frame frequency implemented in the device is 90 Hz, the maximum signal accumulation time will be 2.44 ms, and the azimuthal scan frequency will be close to 1.6 Hz. Hardware-software showed its efficiency in the experiments carried out on the full-scale optical range of the Institute. 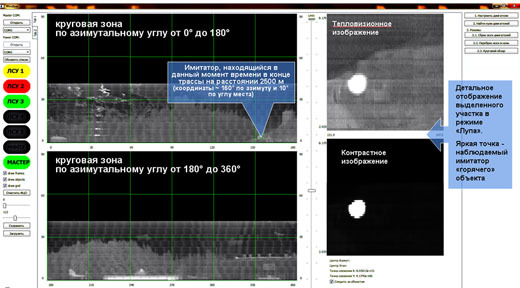 The purpose of the experiments was development of the basic operating mode - a circular scan by the single-frame survey with thermal imaging of the surrounding situation on the monitor. 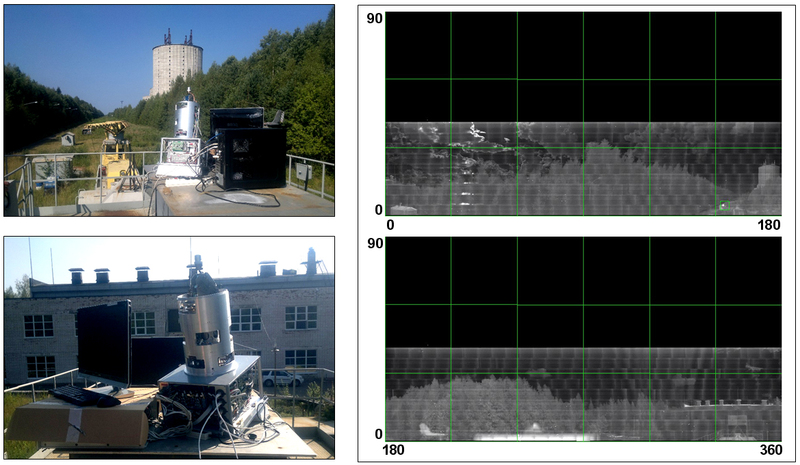 The task was also to assess the possibility of separating a small "hot" object from the surrounding background at the maximum available distance, which was limited to 2600 m (the length of the full-scale optical range). 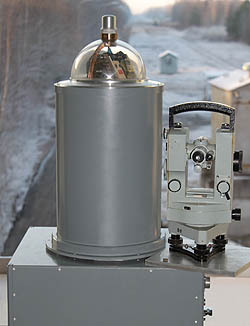 The OESCS was located on the upper platform of the laboratory car, placed at the beginning of the optical range. As a simulator of a small "hot" object serves an electric heating element (TEN) with a radiating surface 25 cm in diameter attached to the end of the crane's boom mounted on the locomotive. The locomotive moves along the entire length of the optical range. The environment is displayed on the monitor.